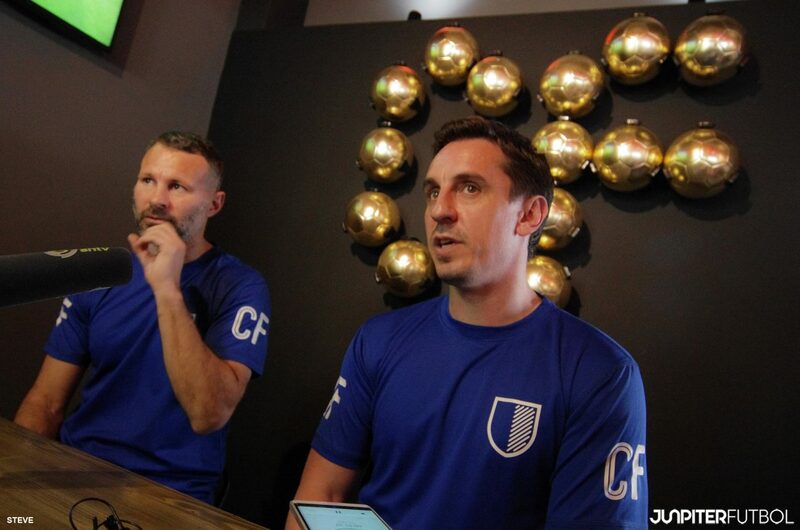 One of the most talked about cafes, Cafe Football Singapore has officially opened by Manchester United legends, Ryan Giggs & Gary Neville! Cafe Football Singapore, a full-fledged restaurant located in The Arena, Singapore’s latest lifestyle and family-oriented destination, is the brainchild of the famous Manchester United duo, Ryan Giggs & Gary Neville which first established in United Kingdom in 2013, jointly with Rowsley Limited. Cafe Football Singapore is the first franchise outside of the UK. The Manchester United legends also joined in the CF Cup 2017 Final where both of them captained each side to the delights of many football fans and guests gracing the event. When Junpiter Futbol asked the Manchester United duo on how their hospitality business plan actually came about, the duo shared their dreams. “Both Gary and I have been discussing about what we are going to do towards the end of our playing days. All the while we are interested in hospitality obviously because we have been traveling, staying in a lot of hotels and visiting many good restaurants. It’s something we talked about for a long time and now we have got Cafe Football Singapore, also Cafe Football & Hotel Football in Manchester and other businesses as well. Just like we were teammates again, both of us want to be as successful as we can, “ said Ryan Giggs. “Football is really a lot more away from us now and the fact is we really need to fill our space. When you are done with football, some go into journalism, coaching, management and also businesses as well. So I think there are many different paths to follow and we have chosen quite a few of those paths to expand our knowledge. And also, we have done quite a few things together with the (Manchester United) football club with the businesses in the hotel and of course Cafe Football Singapore. We are proud of this in terms of the fact that it is something that has expanded and materialized 5-6 years after our first opening in Manchester. Initially, it was an idea and now it has expanded and be real in different parts of the world. We hope that we can continue to expand in the next few years, particularly the hotel rooms which is our priority,” added Gary Neville. Cafe Football Singapore is a full-fledged restaurant in The Arena, which allows fitness enthusiasts of all ages to come together and enjoy a scrumptious meal after a workout or two. 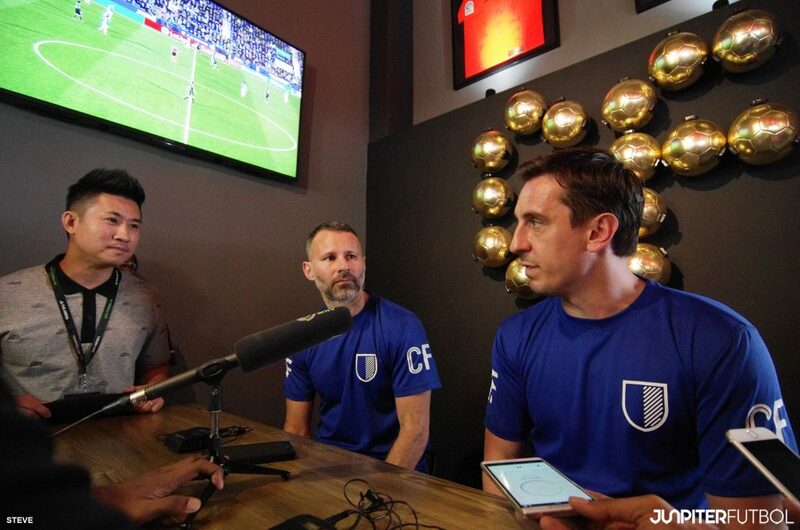 The football-themed restaurant, which is owned by Rowsley Ltd jointly with Gary Neville and Ryan Giggs, was first established in the UK in 2013 and the Singapore outlet is the first franchise in Asia. A unique restaurant that feeds a love for food and football, customers will appreciate a diverse, well-rounded menu with some subtle nods to the beautiful game. Cafe Football is also the Sponsor of Junpiter Futbol’s UAE Football Trip where we managed to cover the Arabian Football League and also conducted an exclusive interview with 2016 Asian Football of the Year Award winner, Omar Abdulrahman. To check out more of Omar’s Interview, Click Here.